Digging the dry well that will divert water from a problem downspout. An ongoing challenge to the preservation of Pittock Mansion and the Gate Lodge is water intrusion. Over the years, shifting hillsides and changing landscapes have resulted in new opportunities for water to infiltrate the buildings during periods of heavy rainfall. As any repairs must be done with an eye toward preservation, creative solutions to direct water away from the buildings without impacting the original architecture were implemented. 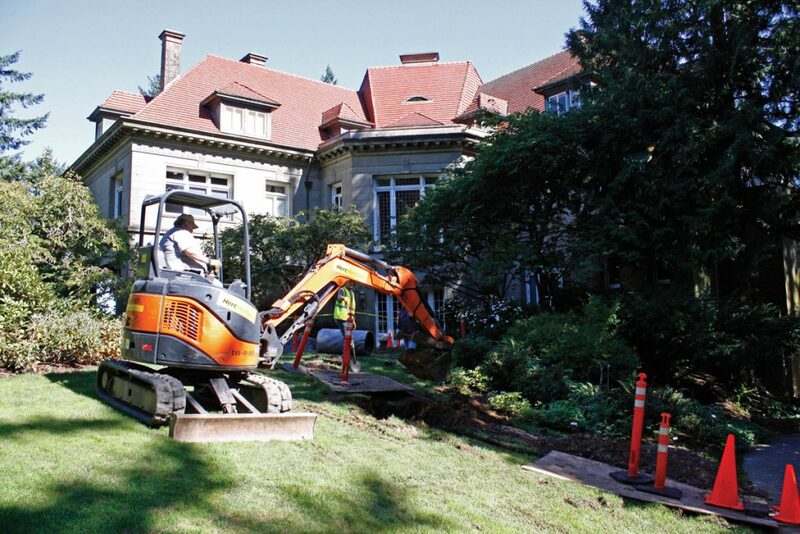 In order to address water that comes in through the northwest side of the Mansion and seeps into the basement, Portland Parks & Recreation installed a new drain system to pull water from an existing downspout and direct it away from the building. In order to achieve this, Parks installed a new grate in front of the French doors and dug a trench for a new pipe system that shifts the water flow to a newly installed dry well in the lawn just outside the Mansion. Sandbags help protect the Gate Lodge from water infiltration until drainage systems can be improved. In addition to the new drain system by the Mansion, Parks will be installing a curb along the pathway in front of the Gate Lodge to direct water runoff away from the building. 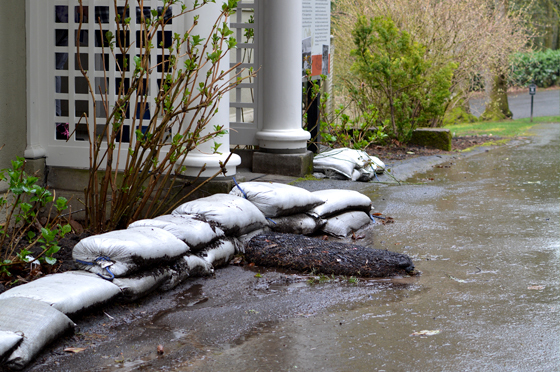 Currently, sandbags keep water from seeping into the Gate Lodge’s Butler’s Pantry and basement. The above projects are just two examples of how the partnership between Pittock Mansion and Parks protects and preserves this beautiful historic site.